Steven Gullotta Industrial Metal Releasing early next month, French industrial-metal band JENX has given their blessing to the keyboardist (also known as Lyynk) to decompose and remix their 2012 album, Enuma Elish. Now, this is the first time I'm taking a listen to JENX at all, but, coming away from this experience, my feelings are mixed. The whole album plays off more into the electro-industrial arena of things, still putting in play the original sounds and structures from the prior album. Perhaps this is best represented within the introductory track on the album, Inner View. This is an eleven minute song that seeks to represent the new thoughts of the keyboardist in one melody. in essence you are given several different songs split up into smaller parts. It creates an amalgamation of industrial-metal fused within drone like tones. It's pretty neat and dandy. However, as for the rest of the album, I can't say I had the same feelings. I feel as if the electronic use in each of the songs is pretty good, but cannot say that the vocals fit in all too well. Yes, I've heard screamo done with electronics before, as most of us had, but this screaming just does not go along with what we're given. I think, as a fixer upper for this album, that the best route would've just been to go straight off into an instrumental deconstruction rather than not. Lyynk is very good with the keys and electronics, but it seems to me that he needs to better place the vocals within the song, or make a beat that can really wrap around the song. I mean, the one instrumental on the album is The Element, and it's another fantastic song on this six track release. I quite enjoyed it, but the good taste in my mouth soured quickly as soon as I moved onto the next song, feeling as if I was dragging my feet through the mud just to get through it. 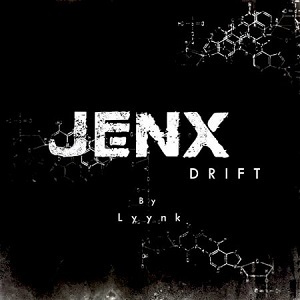 Releasing early next month, French industrial-metal band JENX has given their blessing to the keyboardist (also known as Lyynk) to decompose and remix their 2012 album, Enuma Elish. Now, this is the first time I'm taking a listen to JENX at all, but, coming away from this experience, my feelings are mixed. Now, as I said, I have been left with mixed feelings. I went into this album not really knowing what to expect, and got two sides of one story. There's the bright side, where things are nice and relaxing, able to revitalize my ears for another dose of JENX. But, then there are the dark and evil nooks and crannies where I just want to bury my head into the ground and keep it there. I do wish to hear more from these guys, though, and I do hope to see an instrumental side project come out from Lyynk himself; I think that'd be a joy for us all to enjoy.